The evenings are getting darker, the weather is getting duller, but how many of us are suffering with colds, flu or just not feeling great due to a lack of essential vitamins and minerals? While vitamins, minerals and supplements are no substitute for a healthy, well balanced diet, many studies reveal that, despite our best intentions, most diets (even the more fairly healthy ones), fall short of the recommended daily guidelines for essential nutrients. Supplements are a proven bridge between what we should eat to get the right nutritional balance and what we actually eat. Allcare are now offering a comprehensive collection of multivitamins, minerals, superfoods and probiotics – to help you fill the nutritional gaps in your diet as well as helping improve your long term general health. Here’s a little bit of information about our favourite essential multivitamins, minerals, superfoods and probiotics from cutting edge brands such as Quest, Natures Aid and Proven Probiotics. An elite ultra potent daily multi-vitamin and mineral formula to support optimum performance. How does it help? Designed to suit the needs of those looking for extra supports because of a demanding daily schedule. Contains ingredients to combat negative effects of stress and high energy loss. Contains high doses of the full vitamin B family. High in antioxidants such as Selenium; Vitamin C and Vitamin E plus carotenoids. Contains Magnesium in its highly absorbable citrate form in addition to Vitamin D3. Don’t let your appetite for exotic food slow you down – a probiotic designed to help maintain a balanced digestive system whilst travelling. What is it good for? Travelling, Protects against local ‘bugs’, food and water. Key Features: Designed for easy packing, no need to refrigerate, take before, during and after flight. Does not spoil easily. If you are visiting a tropical location, store away from intense heat in a cool dry place. Most of us are familiar with turmeric as one of the principal ingredients in curries and curry powder as well as being more widely used as a food colouring. But did you know that Turmeric (Curcuma longa) has deep traditional roots in Indian medicine? It has been used for centuries to treat digestive disorders, purify the blood, for skin disorders, morning sickness and liver disorders. What is it good for? Anti-inflammatory, antioxidant, liver support and general circulation. How does it help? The yellow pigments found in turmeric are known as curcuminoids, one of which is curcumin, the most active component. The antioxidant properties of curcumin may well rival those of vitamin C and E. Curcumin seems to increase bile production and flow as well as reducing stomach acid secretion. Improving bile flow can lead to better fat handling and reducing stomach acidity can help to protect the stomach lining as well as that of the intestines. Suitable for vegetarians and vegans. An 8 strain high potency probiotic supplement with 30 million active organisms to support digestive, gut and immune health – the perfect support for your everyday health and well- being. How does it help? Everyday support for gut, bowel, digestive and immune health. Recommended to restore & maintain the natural bacterial balance in the gut affected by travel, stress, drugs and diet. High Potency 30 billion viable organisms. Includes Maltodextrin, as a prebiotic, supporting the probiotic activity. With DR Caps, a unique delayed release capsule shell that protects sensitive bacteria from stomach acid. A natural remedy to reduce cholesterol levels. What is it good for? Heart Health, Circulation, Cholesterol. How does it help? Containing three natural – based Cholesterol – lowering ingredients: plant sterols; red yeast rice extract, and lactobacilli probiotic bacteria. 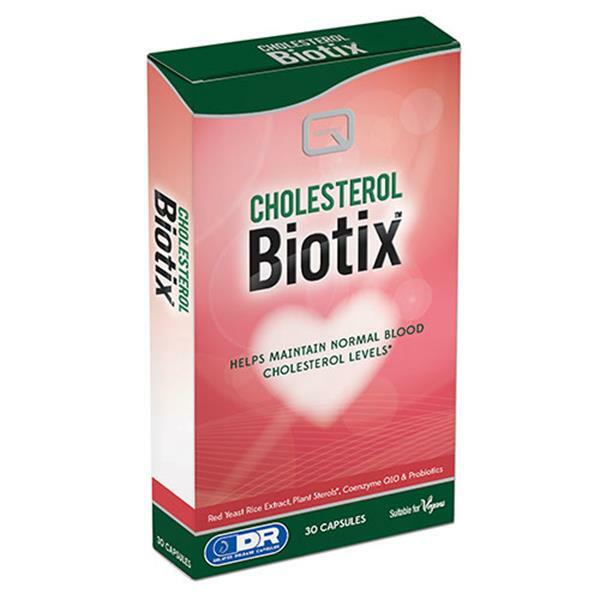 Recommended for patients who have received high cholesterol results from a pharmacy Cholesterol test. It is important to always seek advice from your GP before taking any supplements.